Blue wild pigs were reported in North Canterbury, New Zealand, in the early twentieth century. A 1922 publication noted: Perhaps the most interesting specimen of the wild pig in this Dominion is the blue pig found in the Mount Grey and Karetu districts, North Canterbury. The blue color is produced by a blend of apparently equal numbers of white and black hairs. So fixed is the type that blue pigs may be found in a litter with blacks or black and whites. The blue pig, evidently, is the result of a cross between a black pig and a white pig, and the progeny crossed and inbred until the two breeds are absolutely blended as far as color is concerned. In a study of wild pigs in the northern part of the South Island of New Zealand in 1991, the writers reported that as there was no record of grey/blue domesticated pigs in Canterbury it could be assumed that these came from a wild or semi-wild breed, imported by British settlers who served with the colonial army or public service in India. These Indian colonists were renowned for hunting wild boar, and had earlier introduced European wild pigs into India. 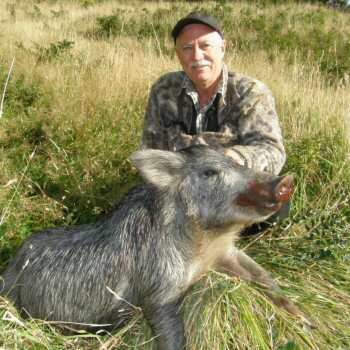 When they moved to New Zealand, they imported a wide variety of wild game ... including pigs in Canterbury, which were subsequently hunted on horseback and killed with spears Because of its large size and aggressiveness the Canterbury grey/blue breed appears close to the Ukrainian wild boar which is the largest and most aggressive of the wild boars. Other features in common are skull shape, coat colour, and the presence of dense underwool.